And so it seems that this would the right time to introduce to this particular audience the concept of the gastropub – with Gordon Ramsay’s stamp on it for legitimacy. It’s the network star power needed to rejuvenate the mall’s image, with certain introductions in tow. 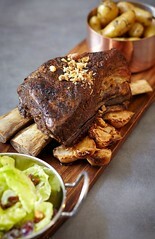 Fat Cow serves burgers but also long rib. Pizza but also charcuterie and cheese. Fish & chips but also ceviche. And while it wouldn’t be prudent to judge during a soft opening whereby many kinks are meant to be worked out, it’s the best menu I’ve had in a mall restaurant. It’s food that out-of-town visitors might imagine is popular in California. Requisite placeholders under the “Californian fare” column included a Ahi Tuna Tartare and Brussels Sprouts and Bacon. I wished there was actually citrus in the Branzino Ceviche as in by definition, except I didn’t taste even the horseradish or ginger that was listed on the menu. A bit like a bland crudo. 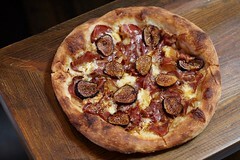 But my favorite stone baked pizza was topped with Coppa Picante and figs, fontina and roasted garlic. Great texture on the toppings and decent crust. The Tuna Niçoise Salad with Blue Lake beans and fingerlings was tasty indeed, but when the salad is $16 and the burger is $14, the tuna belly justification may still be a little bit hard to swallow. The kale salad, while commonplace at any Venice or Silver Lake cafe, is delicious yet diminuitively dubbed the Skinny Cow Salad at a restaurant named for a cow that is anything but. I sense some shame in the tree-hugging slice of our identity, here, but for some reason it makes sense in that transitory way. Go big or go home at The Fat Cow. After all, if you order the fall-off-the-bone, borderline greasy Long Shank, at $25 per person, you’ve committed to the masterpiece of the menu. The sliders, meant to represent the burgers on the menu, were satisfying enough. So as we wait for the place to iron out the kinks from soft opening, I’ll be interested to see the final product – perhaps if I ever end up seeing a movie again at the neighboring Pacific Theatres (in reality, kind of unlikely since I’m by the Arclight). It’s better food than most people eat prior to a movie, and that will do for most. If you must order a cocktail, beware that many of them are sweet – including the Manhattan – but I was actually delightfully surprised by the PIMM’s cup, a fizz version. Their jalapeno-tequila cocktail was nothing to fuss about, either. And as a plus point on what is stereotypically accepted as L.A., perhaps the most glaring Californian menu item omission is the lack of Truffle Oil Fries. And that’s one Gordo decision I can agree with. 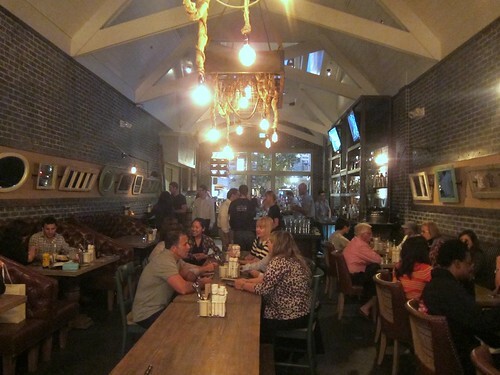 This entry was posted in beer, cocktails, Dessert, Food, Mid-City West and tagged @fatcowla, @gordonramsay01, American, burgers, chef, Fat Cow, Gordon Ramsay, mall, Mathew Woolf, restaurant, truffle oil. Bookmark the permalink.